I think I have found the perfect summer drink for Her Majesty, Queen Elizabeth II, to sip whilst on board the royal boat that will take her down the Thames this weekend to celebrate her Diamond Jubilee. It has a sufficient amount of sugar in it to give her the necessary energy boost to last the occasion and has a hint of decadence with the sweet aromas of rose water. Being non alcoholic and yoghurt based it is wonderfully cooling and lines the stomach well, ahead of the feasts that will no doubt follow. 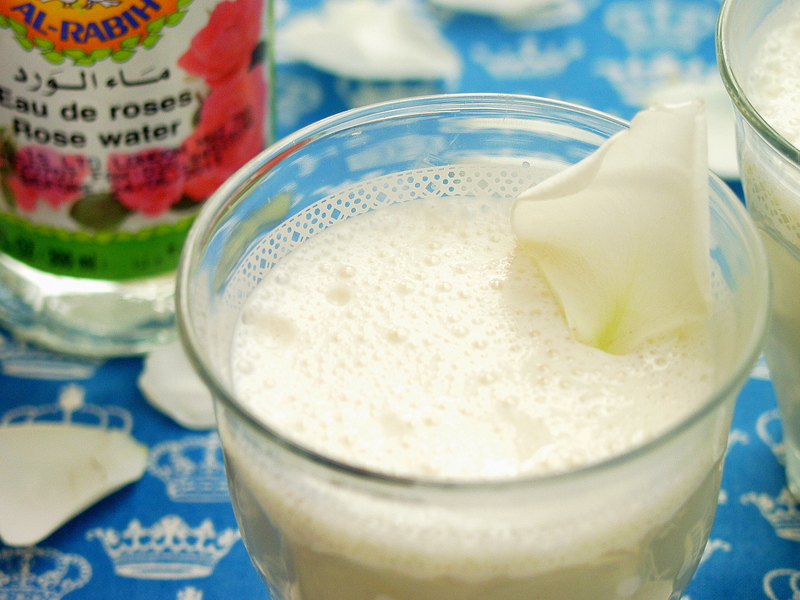 The drink in question – drum roll please – is Rose Lassi. It is quick and easy to prepare and I assure you is a crowd pleaser, for those preferring to keep off the alcohol. Lassi drinks are commonplace in the Indian subcontinent and it is customary, in many households, to have a jug of it in the fridge ready for when guests drop by. Sweet, salt or mango are common flavours, but there is so much potential for many more delicate flavours to be added. How about mint, peach, strawberry, raspberry? My favourite of late has been rose, I hope you agree, it is a drink fit for a Queen. 1. 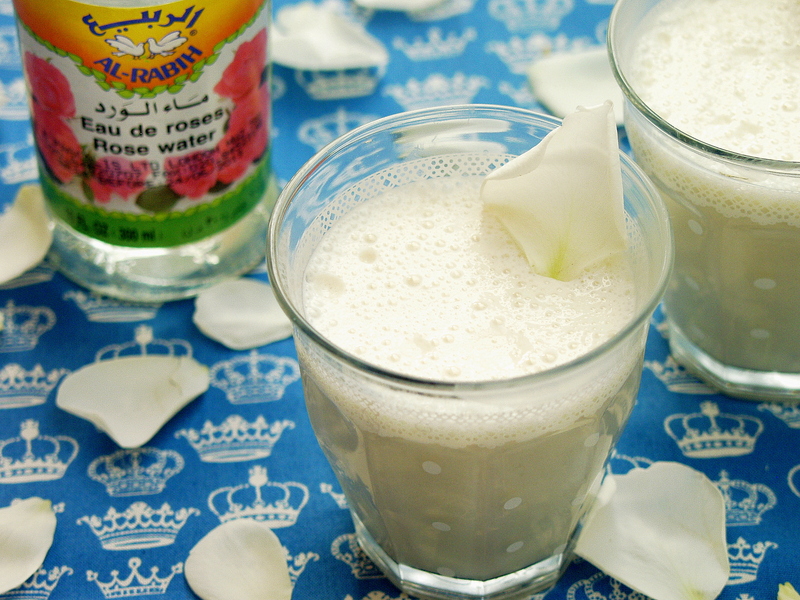 Using a hand whisk or blender mix the yoghurt, sugar, water and rose water together so that it begins to froth. It will only take about 30 seconds. 2. If using a hand whisk, crush the ice in a plastic bag using a rolling pin and add to the other ingredients. For speed and ease I use a blender. Once there is a sufficient amount of froth pour into glasses and serve immediately. 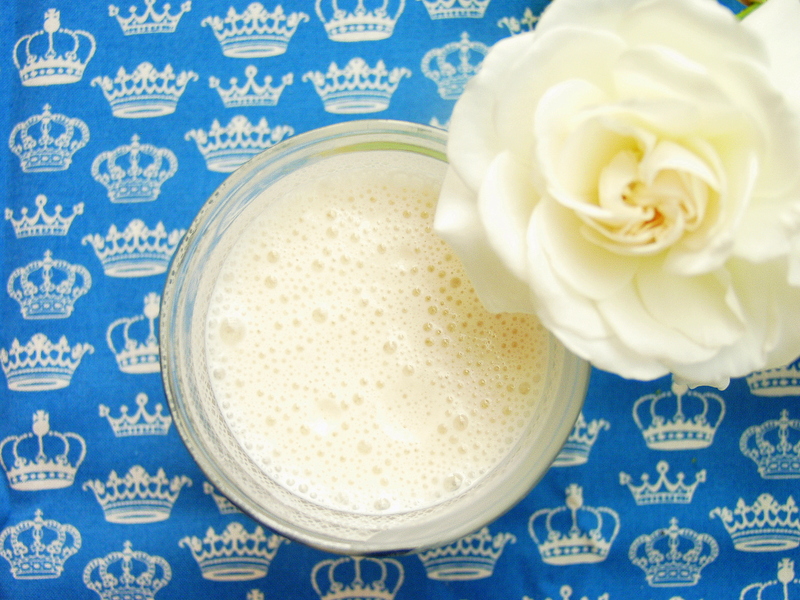 This entry was posted in Celebrations, Drinks and tagged diamond jubilee, Her Majesty, lassi, mango, Queen, rose, rose petals, rose water, salt, soft light brown sugar, sweet, yoghurt. Bookmark the permalink. By Golly that looks delicious! Kind of you to say. Thank you for commenting. I would stick around and read more… but your super-awesome pictures are too tantalizing for mid-day at work! This is a great recipe. I served it with lunch & everyone enjoyed it.